It was an all-too-familiar story of missed chances for the Rocks as they slipped out of the Velocity Trophy at Hythe Town. Despite taking an early lead through Tommy Scutt, Bognor couldn't turn a decent amount of possession and chances into more goals - and paid the price in the second half as Town scored twice to go through to a third-round tussle with Burgess Hill. The first challenge for the Rocks was finding enough players to field an XI and a few subs. With striker Dan Smith and defenders Corey Heath and Keaton Wood already injured, centre-half Joe Dandy is the latest to be added to the men in the treatment room. He picked up a knock in Saturday's 0-0 draw with Margate and has been recalled for treatment by Pompey. Up front Jimmy Wild has picked up a bout of tonsilitis, while Brad Lethbridge is wanted for Pompey for their FA Youth Cup tie tonight against Bristol Rovers. That meant a start for young forward Josh McCormick and places on the bench for youngsters Jamie Carroll, Charlie Osborne and Harvey-Jay Bain. Hythe forced Dan Lincoln into a fine early save - the first of several he needed to produce during the game - but it was the Rocks who took the lead when McCormick's neat work set up Tommy Scutt for the opener. Bognor forced the pace for a while and home keeper George Kamurasi had to be alert a number of times to stop them going two up. As the game wore on Hythe, who play one division below the Rocks in the Bostik League, gained in confidence and they levelled on 61 minutes when winger Kieran Campbell streaked away and crossed for Jack Sammoutis to net. Hythe scored the winner with eight minutes of the 90 left through Zak Ansah - their prolific striker who has already scored 20 goals this season. It was a simple enough turn and shot from six yards. 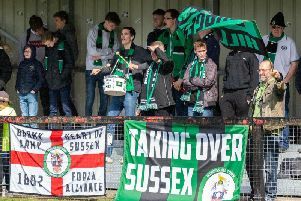 Jimmy Muitt missed a late sitter for the Rocks and they and their hardy band of fans who made the trip were left to reflect on the fact they now have only the FA Trophy and Sussex Senior Cup to think about in addition to their Bostik premier campaign. It's the FA Trophy that occupies them next - they go to Bostik south central leaders Bracknell on Saturday in the first qualifying round, perhaps slightly worried that their hosts go into the game off the back of a fine start to the season and a 7-1 win at home to Egham last night. The loss at Hythe was the Rocks' second cup loss to a lower-ranked team this season after their FA Cup reverse at Sudbury a fortnight ago - and they won't want to make it an unwanted hat-trick in Berkshire. Bognor: Lincoln, Davies, Tomlinson, Tuck, Field, Block, Whyte, Scutt, McCormick, Muitt, Walsh. Subs: Osborne, Carroll, Bain.